I am so excited! Snow. Beautiful snow! I just can’t wait to wake up to white flakes floating down on a calm and peaceful morning. There will be screeches of delight when my family looks out to see the first real snow of winter. Now, to some folks, those are fighting words. With snow comes frigid weather, tricky driving conditions, and lots and lots of shovelling. But, I am here to tell you to turn that frown upside-down and to decide to delight in the joys of winter on the prairies! Why? Because some people never get to experience snow. Can you imagine going through life wondering what it’s really like? How rain can be so cold that it turns into zillions of magical, artistically unique crystals? How people can build quinzhees or igloos that can be slept in during the winter? And the winter sports: it is just so much fun to go snowshoeing, skating, skiing, snowmobiling, or sledding on a nearby hill! And, there’s that awesome feeling of coming in out of the cold to a cup of hot chocolate and the warmth of a cozy fireplace. Yes, I do love snow. It is a conversation starter, especially when it makes an appearance in a season other than winter. Shovelling is great exercise. Snow painting, building a snowman, or creating ice sculptures is how family memories are made. And, let’s not forget about playing Fox & Goose after a fresh snow in the schoolyard! I look forward to sharing my winter discoveries with you through photography. The image I share with you today was taken in October 2016. 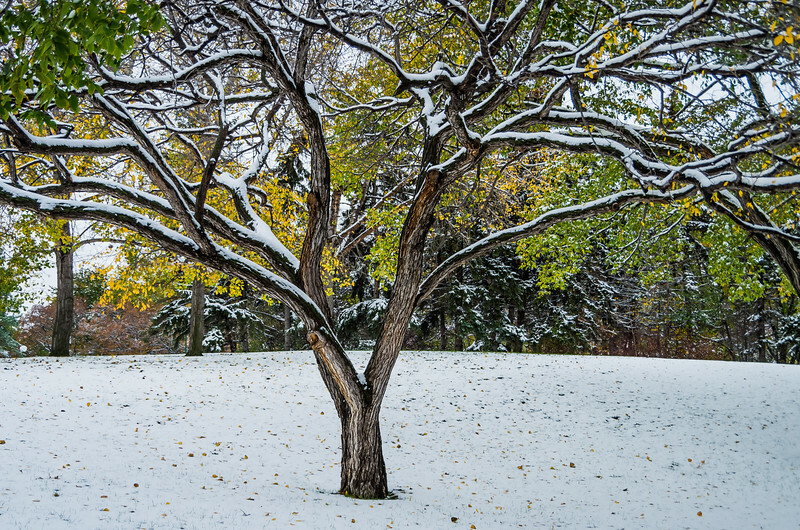 I was fascinated with the combination of autumn colors and the snow-lined tree branches. It melted shortly after I took this photo, and we’ve had a warm autumn since. But, I anxiously await winter’s snow. Thanks again for sharing in my journey! If you have any questions or comments, please feel free to comment below, or contact me via my Facebook page or the Contact Form on dwilapix.ca. If you're a fan of photo-sharing social media, find and follow dwilapix on Instagram!